Upcoming Xiaomi POCO F2 phone has been spotted on a new Geekbench listing today, just a few days after Xiaomi Poco F1 Lite was seen on Geekbench. The alleged Poco F2 listing suggests that the successor to the massively successful Xiaomi Poco F1 will be powered by Snapdragon 855, which is more energy efficient than its predecessor Snapdragon 845, which powered Poco F1. We can see the presence of just 4GB RAM which may not be the true RAM capacity in this new phone. That’s because POCO F1 came with 6GB and 8GB RAM variants and it’s unlikely for its successor to come with a 4GB RAM, especially when the recently found Poco F1 Lite too is likely to have 4GB RAM. 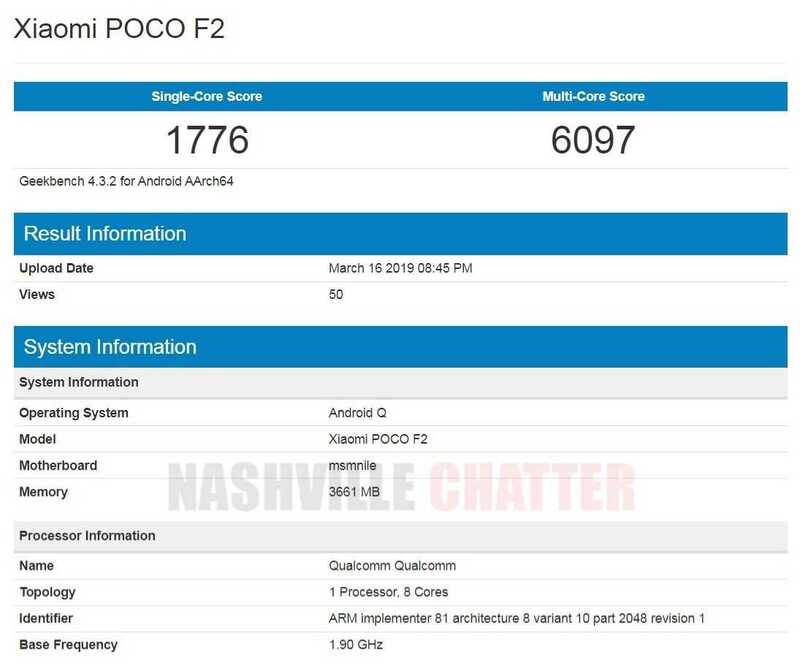 Similarly, although the Geekbench listing suggests Poco F2 will come with Android Q as the OS, we can expect Poco F2 to ship out of the box with Android 9 Pie OS and later get updated to Android Q OS after its release in the second half of 2019. In addition to this, the single and multi core scores on Geekbench don’t really reflect typical performance scores of a Snapdragon 855 powered phone! The single core score is 1776 and multi core score is just 6097 whereas most phones powered by the Snapdragon 855 processor (codenamed MSMNILE) have multi core scores in the range of 10,000 or thereabouts. Let’s wait for more details to be revealed about the new phone in the making.